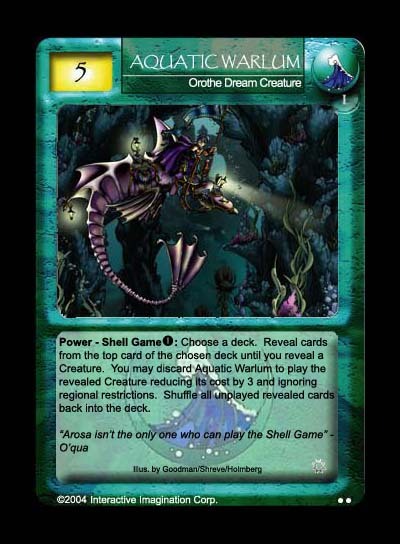 Aquatic Warlum, together with O'Qua, Tracker and Sink and Swim, is a steal-a-creature card. This was one of the first Orothe card designed by Stephan Classen and myself, with the reasoning that d'Resh shouldn't be the only region that can steal a creature from an opponent's deck. The result as you can see is a creature influenced by Bottled City, only in creature form. This design would later influence the design of O'Qua, Tracker and Sink or Swim. The artwork is taken from one of the promotional images that 2i put out sometime back.